This email arrived in my spam box, so I almost missed it. The Ada County Democrats and the BSU College Democrats are kicking off a new, monthly "Blue Tube" film series featuring progressive films. The first one, Robert Greenwald's Iraq for Sale: The War Profiteers, will be screened this Friday, May 4, at 6 p.m. at the BSU Special Events Center. Tickets are $10, or free to anyone with a BSU student ID, you lucky scamps! Happy Monday, everyone. Here's hoping you had a fine weekend amid the warm weather and cottonwood blizzards. I spent mine dropping lit, pulling weeds, and enjoying springtime in the not-so-big city. As I noted on Friday, the 2007 Big Read has begun in Boise. A Farewell to Arms, Ernest Hemingway's 1929 book about love and war - seems like an appropriate selection for our time, as tens of thousands of American families deal with deaths, injuries, and uncertain futures caused by our nation's present-day military adventures. Here's the full schedule of events. I've also noted a few in the listing below. What about you? What's your Big Read? I challenge you to name just one book! Bonus question for today: What about Z? Not only did Boise State quarterback Jared Zabransky not get picked in this weekend's NFL draft; he apparently didn't get any interest as a free agent, either. Is his lackluster junior year the reason, or were there just too many other good QBs this year? Here are some events happening this week. Feel free to add others in the comments. All week - It's Boise Music Week's 89th year, with free concerts planned all over town. Click here for the schedule. Monday, April 30 - The North End Neighborhood Association meets at 7 p.m. today at 1520 N. 12th St., Boise. Tuesday, May 1 - A discussion of A Farewell to Arms will happen at 7 p.m. at the Caldwell Public Library. Wednesday, May 2 - The Eagle Library plans a discussion of A Farewell to Arms. 7 p.m.
Thursday, May 3 - The East End Neighborhood Association meets at 6:30 p.m. in the gym at Roosevelt Elementary School, 908 E. Jefferson St., Boise. Thursday, May 3 - The Big Read presents a panel discussion on "Healing and Recovering From War" at 7 p.m. in the Boise Public Library auditorium. Participants will include returning Iraq vets, a specialist on post traumatic stress syndrome, a mother of a soldier currently serving in Iraq, and VA personnel. Sali is one of seven lawmakers - seven! - to vote no on funds to help victims of torture. The bill passed 418-7. He voted no on a bill to improve access to small-business loans. The legislation passed 380-45. And he voted no to help support research in science and engineering. The bill passed 397-20. In a comment from my last post, Irwin noted a recent letter to the editor from Sali in which the congressman attempted to defend his vote against harsher federal penalties for dogfighting and cockfighting. Way to go, Idaho bloggers (especially MGR) and blog readers. It's apparently up to us to keep tabs on Sali, because - as I remarked 10 days ago - the mainstream media, the people who supposedly get paid to do this work, aren't doing it. Update: I've posted a diary at Kos where we can keep track of Sali's most outrageous votes. I've also added it to the 2008 Elections blogroll at left. In a recent column Kevin Richert said that he wasn't sure if he would pin the regional strength of Democrats to a stronger Democratic Party but rather to voter dissatisfaction with the Bush administration. While dissatisfaction with the current administration is apparent, what isn't apparent to Mr. Richert is that significant political realignment is taking place in our region. While all the reasons for this realignment are not fully known, dissatisfaction of voters goes much beyond the Bush administration. Voter dissatisfaction is also tied to the fact that Republicans neglect the needs of the majority in our growing and changing region while catering to extreme interests. The growing political strength of Democrats in the Mountain West comes from fielding moderate candidates who favor practical and pragmatic solutions and are forward-looking. The Democrats elected in our region are culturally and fiscally conservative while being progressive at the same time. Other measures of the growing strength of Democrats in the Mountain West are the 2008 Democratic Convention in Denver and the growing number of regionally based Democratic organizations, Web sites and blogs. All of these developments offer hope for Democrats here in Idaho as our candidates learn and benefit from successes elsewhere. On Saturday and Sunday, there's a family fun pet expo at Expo Idaho in Garden City. (You may still know it as the Western Idaho Fairgrounds.) Hours are 10 a.m. to 5 p.m. Saturday and 10 a.m. to 4 p.m. Sunday. Or if you can't keep a pet, maybe you can have a gargoyle. A gargoyle open house is planned from 10 to 4 Saturday at 295 N. Orchard St. in Boise. This weekend also is the kickoff of the 2007 Big Read in Boise, featuring A Farewell to Arms by Ernest Hemingway. Tim Johnstone and Ken Bass from The River will preside over a trivia contest on The Grove at 11 a.m. Saturday; "An Interview with Papa" featuring actor David Blampied and Hemingway expert Ted Dyer is set for 7 p.m. Saturday at Satchell's Grill, 705 W. Bannock St.; and a relay read-a-thon of the novel will start at 10 a.m. Sunday at Barnes & Noble on Milwaukee Street in Mallville. Sunday brings a Dia de los Ninos/Dia de los Libros (Children’s Day/Book Day) celebration at the Boise Public Library, with family fun activities focused on literacy, learning, and cultural diversity. The event will be co-sponsored by Garabatos Spanish Preschool. The idea, says owner Brian Cronin, is to have a "fun and stimulating afternoon that showcases Boise ’s growing diversity and our impressive multicultural and multilingual resources.” Drop by anytime between 2 and 5 for dancing, music, storytime, and yoga for children. See the full schedule here. Fun fact: Idaho was the first state in the nation to declare an official Children’s Day. Bipartisan legislation naming April 30 as Children’s Day (El Día de los Niños) was passed in 2003. Maybe they'll have to amend it now that Idaho has gone on record as "English only." Harumph. Sunday at 3 also is the monthly planning meeting of Idahoans for Obama. It's happening at Papa Joe's Pizza, 1301 S. Capitol Blvd. in Boise. Senate watch: Vasquez out, Shealy in? Robert Vasquez, we hardly knew ye. Actually, Idahoans knew ye all too well - as a single-issue flamethrower - and that's why your Senate campaign went nowhere. Idahoans may differ on how to resolve the nation's illegal immigration situation, but most of us agree that relentlessly demonizing Latinos and Mexico won't solve anything. Jim Risch - Only if Craig opts out (he says, fingers crossed behind his back, secretly wishing for just that). Mike Simpson - Possibly, if Craig doesn't run. The rank indecision and jittery deference on the GOP side can only help LaRocco, especially if he can outraise Craig this quarter. Update May 2, 2007: The Idaho Statesman reported today that Alan Shealy isn't sure whether he'd run as a Democrat or a Republican, if he runs at all. Let's raise a toast to John Foster, new executive director of the Idaho Democratic Party. Foster's selection was announced yesterday by state party chair Richard Stallings. The former journalist was most recently managing editor of the Idaho Business Review. He replaces Maria Weeg, who left a month ago to become exec of the Arizona Democratic Party. Something very interesting happened at the IBR during the past session of the Idaho Legislature. Largely through a blog written by Foster himself, the IBR became less the voice of big business and more of a champion for the start-up entrepreneurs and workers who really keep Idaho's economy humming. Idaho's future is in danger of being kneecapped by legislators who refuse to address the state's growth, and Foster called 'em on it. Or as Tom Paine wrote at 43rd State Blues just a few weeks ago, the agile and alert Idaho Business Review - more so than the Idaho Statesman - was reporting on "the true and actual subplots behind the public face of these wingnut dirtbags that run Idaho." So welcome, John, and good luck. We rank-and-file Dems look forward to working with you to ensuring that Idaho is the next state to join the purple mountains of the new - and increasingly Democratic - West. I'm taking today and tomorrow off. Enjoy this video in my absence. It's a little old, but still great. (It'd be even better if Jon Stewart was playing W, but oh well ...). Thanks to Kurt for passing it along. Back here in the reality-based community, Bill Moyers is returning to PBS with a weekly series, Bill Moyers Journal, starting Friday. But first, Moyers' new documentary, Buying the War, will show how the U.S. mainstream media helped the Bush administration sell the Iraq war to the American public. The 90-minute special airs tonight (Wednesday) at 9 p.m. Mountain and Pacific on Idaho Public Television. I hope to catch a replay of the South Carolina Dem debate on Thursday evening and write about it soon after. Remember, it airs live starting at 5 p.m. Mountain, 4 p.m. Pacific on MSNBC. Use this as an open thread if you watch it and can comment before I do. You can post reax to Moyers here as well. A few weeks ago, I ran an item on a report - finally picked up by the paid media this past weekend - that shows how Idaho now ranks at the absolute bottom in congressional clout, thanks to our all-GOP delegation. In no area are we more compromised by this lopsided representation than finding a sane way forward out of the military disaster in Iraq. Clearly, there are some Republicans questioning the Bush policy on Iraq, but none of them are from Idaho. 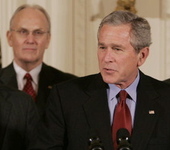 To a man, Larry Craig, Mike Crapo, Bill Sali, and Mike Simpson are acting as rubber stamps for a failed policy in Iraq. Even though the war is the most pressing issue on our national plate, it's hard to find mentions of Iraq on their websites - no surprise, since each man unquestioningly stands behind Bush. Larry LaRocco, who will challenge Craig (or whomever the GOP nominates) for Senate next year, is already pressing Bush and Craig on the issue. In a statement, LaRocco said, "As a veteran and a parent, I know the current policy of escalation in Iraq is not what Idahoans want and expect. The president has chosen a policy that divides America rather than a policy that unites us. "When the powers of the executive branch go unchecked, as they have in Iraq, it's time for the Congress to act and seek accountability from the administration. Our sacred Constitution expects the Congress to serve as the checks and balances and demand accountability. Instead, Senator Craig has been a rubber stamp for a policy in Iraq that is delusional and has no end in sight. The Congress should follow the lead provided by the Iraq Study Group and begin a withdrawal of our brave troops, re-deploy our troops within Iraq, and turn over military operations to the Iraqis. "The time for a new direction in Washington is now," LaRocco added. "Larry Craig has shown he is not willing to listen to Idahoans on the most important issue facing us today Following a failed strategy over a cliff is not leadership. Allowing a president to divide our country is not leadership. We can and must do better." Well, we blew it here in Idaho last fall, and a chance at getting responsible new leadership unfortunately won't fully come for another 18 months. But LaRocco is right: Craig and the rest of the delegation are ignoring the will of most Idahoans in flat out refusing to admit that a change of course is needed in Iraq. Idahoans need to recognize that and prepare to turn Craig, Sali, and Simpson out of office next year. (We're stuck with Crapo until 2010.) Our nation's future depends on it. 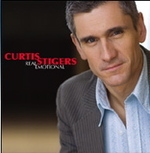 Boise-based jazz man Curtis Stigers is big in the U.K. How big? He's one of three musicians - Madeleine Peyroux and Allan Touissant are the others - up for a BBC Jazz Artist of the Year award. Go here to read more, and follow the links from there to vote for Curtis. Do it soon, because voting closes April 29. His new Concord CD, Real Emotional, is already out over the pond, with a U.S. release set for late summer. Also worth noting amid Stigers' busy overseas touring schedule: A June 23 hometown gig at the Gene Harris Bandshell in Julia Davis Park.